Three Jaish-e-Mohammed terrorists, including 'Kamran', who was suspected to be linked to the February 14 terror attack on CRPF convoy, were killed in a fierce 16-hour encounter, in which an Army major and four security forces personnel lost their lives in south Kashmir on Monday. The bloody gun battle left a civilian dead in the crossfire, besides injuries to Deputy Inspector General of Police (South Kashmir) Amit Kumar, a Brigadier, a Lt Colonel, a Major and four other ranks of the Army unit which carried the operation in the Pinglan area of Pulwama district, 12 km from Thursday's audacious attack on CRPF personnel which left 40 jawans dead. Jammu and Kashmir Police was on the lookout for Kamran, the so-called divisional commander of Jaish-e-Mohammed for Pulwama, Tral and Awantipora areas of South Kashmir, after a suicide bomber belonging to the terror group drove his explosives-laden vehicle and detonated himself near a CRPF bus last week. The Pinglan encounter claimed the lives four Army personnel, a policeman, three Jaish-e-Mohammed terrorists and a civilian, the officials said. Two of the slain terrorists were identified as Kamran, a Pakistani national, and Hilal Ahmad, a local recruited by the terror group, they said, adding the identity of the third is being ascertained. The slain soldiers were identified as Major V S Dhondial, Havaldar Sheo Ram and Sepoys Hari Singh and Ajay Kumar. A head constable of the police was also killed. The injured included DIG (south Kashmir) Amit Kumar, who received a gunshot wound in the abdomen, and a brigade commander, who suffered injury in the leg. All the injured are stable, the officials said. Giving details, the officials said that an input was received from the police about presence of the Jaish terrorists in the area. Immediately, a cordon-and-search operation was initiated and a house-to-house search was being conducted in the area. As the process was going on, terrorists fired at the army party that resulted in the death of the major and other personnel in the early hours of Monday. There after, forces concentrated on the house from where the firing was coming and killed two of them -- Kamran and Hilal. As the mopping up exercise was continuing, the third militant started firing, resulting in injuries to other personnel, they said. The third militant, who is yet to be identified, continued to move from house to house and carried out surprise attacks that resulted in injuries to the DIG and Brigade Commander as well as another Major. 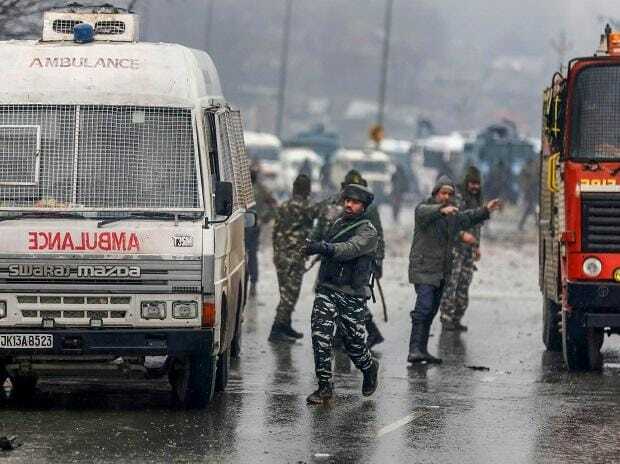 The Jaish has claimed responsibility for the February 14 terror attack that targeted a convoy of 78 vehicles on its way from Jammu to Srinagar. About 2,500 CRPF personnel were on their way to the valley, many returning to work after leave. The Army paid tributes to the fallen soldiers at a solemn ceremony at Badami Bagh Cantonment, headquarters of the 15 Corps here. Corps Commander Lt Gen K J S Dhillon led other ranks in paying homage to the four soldiers including Major Dhondial, who laid down their lives in the operation, a defence spokesperson said. Representatives from other security agencies also joined in paying their last respects to the soldiers. An army spokesperson said the 33-year-old Major had joined Army in 2011 and belonged to village Dangwal in Dehradun, Uttarakhand. He is survived by wife. Havaldar Ram (36) had joined Army in 2000 and hailed from Jhunjhunu, Rajasthan. He is survived by wife and a son. Sepoy Singh (26) belonged to Rewari in Haryana. He joined the Army in 2011 and is survived by his wife and son. Sepoy Kumar hailed from village Bastikri in Meerut, Uttar Pradesh. The 27-year-old had joined the Army in 2012 and is survived by his wife and a son. Their mortal remains were flown to their native places for the last rites. In this hour of grief, the Army stands in solidarity with the bereaved families of the slain personnel and remains committed to their dignity and wellbeing, the spokesperson said.